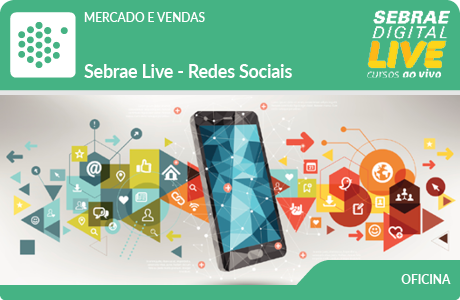 PARTICIPE DA LIVE E APRENDA COMO IDENTIFICAR QUAIS REDES SOCIAIS UTILIZAR NO NEGÓCIO E QUE TIPO DE DIÁLOGO CRIAR COM SEUS CLIENTES NAS REDES SOCIAIS. APRENDA TAMBÉM COMO ELABORAR UM PLANO DE AÇÕES PARA CRIAR, POSTAR, ENGAJAR E MONITORAR O DESEMPENHO DAS REDES SOCIAIS UTILIZADAS. 1) A EVOLUÇÃO DA INTERNET NO BRASIL. 2) REDES SOCIAIS. 3) O QUE FAZER, PARA QUEM FAZER E COMO FAZER. 4) COMO CONVERTER EM VENDAS? 5) FUNIL DE VENDAS DIGITAL. 6) ENGAJAMENTO. 7) DICAS PARA UMA BOA POSTAGEM. 8) FACEBOOK, INSTAGRAM, WHATSAPP BUSINESS, YOUTUBE, LINKEDIN. 9) DETERMINANDO PERSONA. 10) MONITORAMENTO.